Colder temperatures have kept crabs out of Antarctic seas for 30 million years, but warmer waters from the ocean depths are now intruding onto the continental shelf, and this seems to be changing the delicate ecological balance. An analysis¹ has suggested that 1.5 million crabs already inhabit Palmer Deep, an ocean floor valley. Native organisms have few ways of defending themselves against an invasive species like this. There are no local hard-shell-crushing predators in Antarctica. Rising crab populations and other effects of the warming water could change a sea-floor ecosystem that is like no other on Earth. Scientists are continuing to document these effects and another research group has discovered more crabs on another part of Antarctica’s continental shelf². The continent separated from South America 40 million years ago, allowing the emergence of the circumpolar ocean current, which isolated Antarctica from warmer air and water masses farther north, plunging it into perpetual winter. As temperatures fell, the sea floor bloomed with soft-bodied echinoderms. Crush wounds caused by crabs or sharks on the arms of fossil starfish and sea lilies rarer, evidence that these predators were declining³. At temperatures below 1˚C, crabs and lobsters become unable to regulate magnesium in their body fluids, leading to narcosis, clumsiness, and paralysis of breathing. Most of the 100 fish species found on the Antarctic shelf belong to a single sub-order that has evolved antifreeze proteins to keep their blood flowing at subzero temperatures. The ecosystem is reminiscent of one from 350 million years ago, when predators are slow-moving invertebrates like starfish. There was a relaxation of natural selection, allowing species to lose their natural armor. Western winds are strengthening and the circumpolar current is intensifying, driven onwards by atmospheric warming and a hole in the ozone layer above Antarctica. This is lifting warm, dense, salty water from 4,000 meters down in the Southern Ocean up over the continental shelf. The temperature of this intruding water is only about 1.8 °C — but for an ocean region generally between 1 and −2 °C, the impact is substantial and it’s enough to allow the incursion of invasive species. Based on radioactive carbon-14 measurements, researchers believe the warm water incursion began in 1920 or 1930. 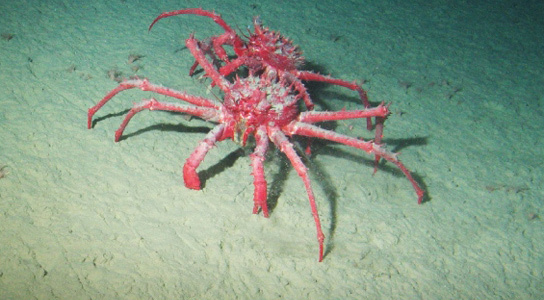 Neolithodes yaldwyni king crabs were discovered in Palmer Deep, 120 km from the edge of the continental shelf. 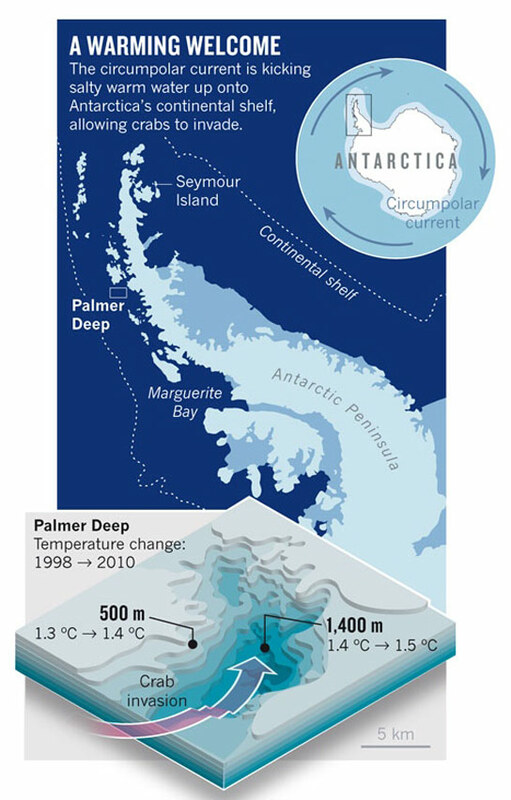 To reach this location, they must have crossed a cold, high mountain pass at only 450 meters below sea level before settling into Palmer Deep, at depths of 800 to 1,400 meters¹. The crab invasion could have started 10 or 20 years ago. Genetic testing is being done in order to find out the crabs’ exact arrival in Palmer Deep. The crabs are also reproducing quite quickly, and seem to be here to stay. As the ceiling of cold water continues to lift over the next 10 or 20 years, crabs could spill out of Palmer Deep and Marguerite Trough and colonize the broader continental shelf at depths of 400 to 600 meters, devastating the endemic sea life. The warm waters will also bring other dangers for Antarctica’s sea-floor gardens. 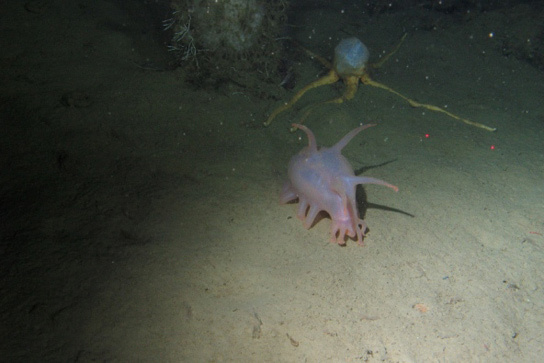 Many of the species in Antarctica’s sea-floor gardens are extremely sensitive to increases in temperature, and could slowly suffocate when exposed to warmer waters ⁴ ⁵. About half the species studied seem to do fine in warmer waters, but the rest seemed to suffer. Antarctic clam (Laternula elliptica)⁴ and shallow water brittlestar (Ophionotus victoriae)⁵, which subsist on dead plankton and other organic trash falling from above, turning it in to biomass that feeds everything else on the sea floor, will either die or become dangerously sluggish at temperatures of 1˚C and higher, which will become widespread in the next 50 to 100 years. If rising temperatures cause brittlestars and clams to disappear, then more falling detritus might be consumed by microbes instead of being converted into edible biomass, sustaining fewer animals on the sea floor. Filter-feeding sponges might multiply to fill this niche, but the mix of species supported further up the food chain might no longer include large numbers of archaic predators such as starfish, ribbon worms and sea spiders. For now, marine ecologists are watching and plan on using repeat surveys to show if this invasion is here stay and if the crabs are expanding their foothold. Smith, C. R. et al. Proc. R. Soc. B 279, 1017–1026 (2012). Aronson, R. B., Vos, S., Thatje, S., McClintock, J. & Amsler, M. Climate Change and the King Crab Invasion of Antarctica Presented at the SCAR Annual Meeting, Portland, Oregon, 13–25 July 2012. Aronson, R. B., Blake, D. B. & Oji, T. Geology 25, 903–906 (1997). Peck, L. S., Morley, S. A., Pörtner, H.-O. & Clark, M. S. Oecologia 154, 479–484 (2007). Peck, L. S., Massey, A., Thorne, M. A. S. & Clark, M. S. Polar Biol. 32, 399–402 (2009). 4 Comments on "Invasive Species King Crabs Could Wipe Out Antarctic Ecosystems"
“warm water incursion began in 1920 or 1930” but some how “Western winds are strengthening and the circumpolar current is intensifying, driven onwards by atmospheric warming and a hole in the ozone layer above Antarctica.” So now global warming is also to blame for something that happened almost 100 years ago. Just once I would like some honesty from one of these “reports”. How about mentioning that even without the human race ever existing there would still be a hole in the ozone over the south pole every winter? How about mentioning the the UV protection of the ozone layer is pointless in the polar winter since it gets almost no UV radiation in that season? That won’t stir up panic and get people to fund more research, so you’ll never hear that.